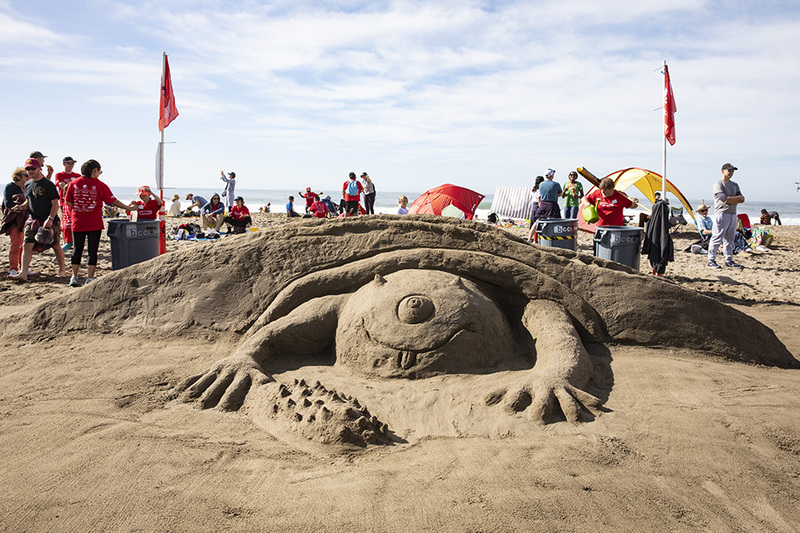 Sun, sand and fun converged on Saturday for the 36th Annual Leap Sandcastle Classic, held at Ocean Beach. 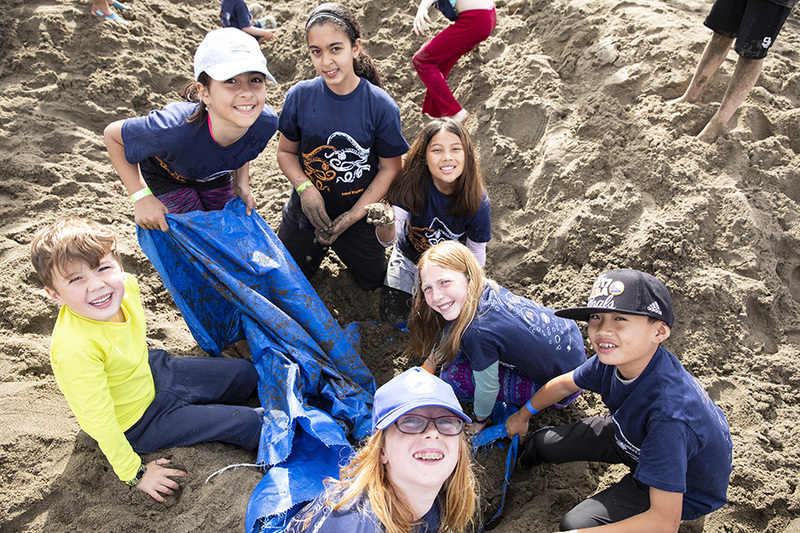 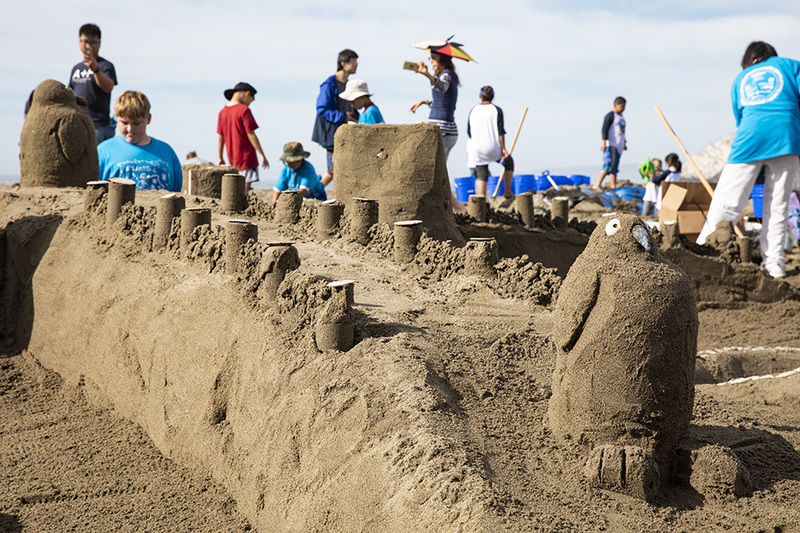 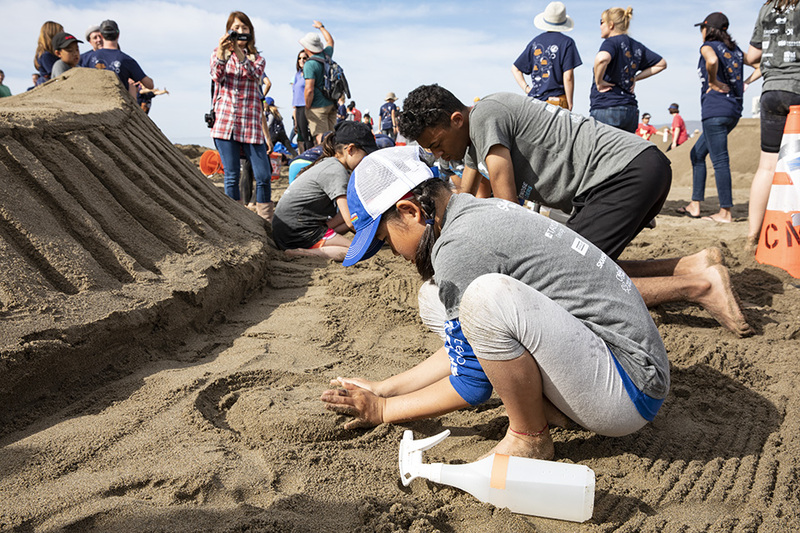 The largest sandcastle competition in Northern California brings together teams of local elementary school students, architects, engineers, contractors, designers and corporations to create giant sand sculptures. 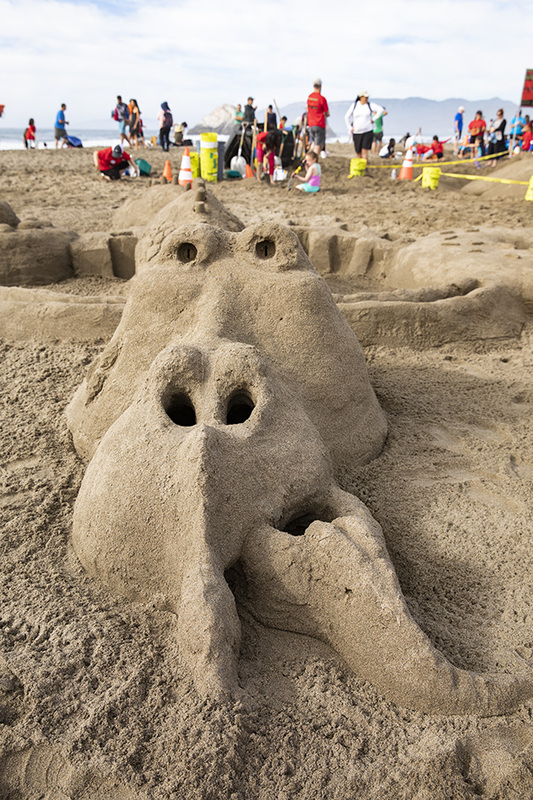 The Sandcastle Classic is a fundraising event hosted each fall by Leap Arts in Education. 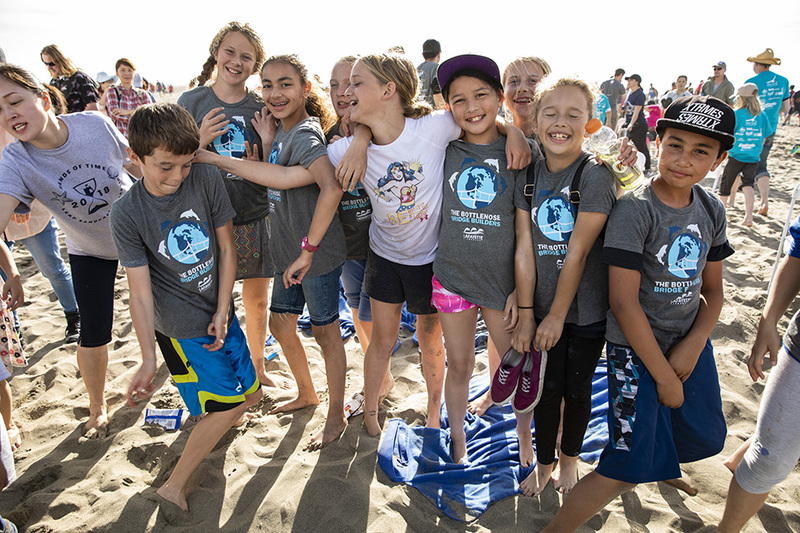 The private nonprofit was founded in 1979 "in response to the severe cuts in California's school budgets that eliminated the arts from elementary education." 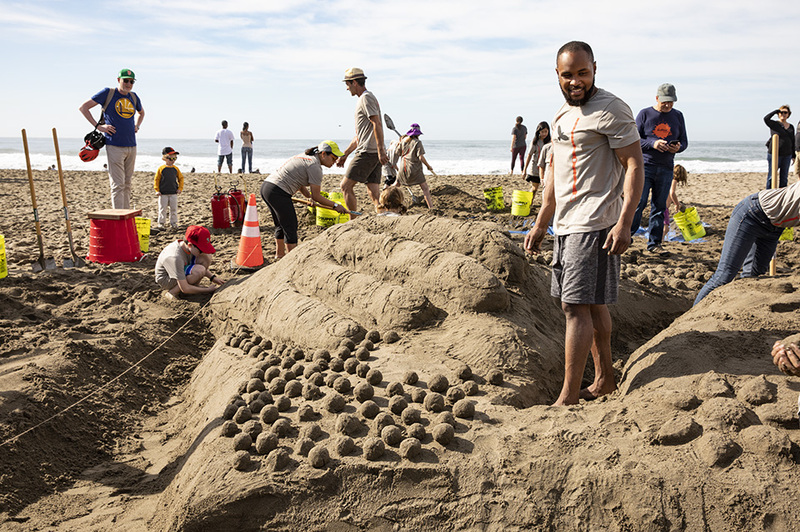 The funds raised each year help the organization bring hands-on art education to 30 schools across the Bay Area. 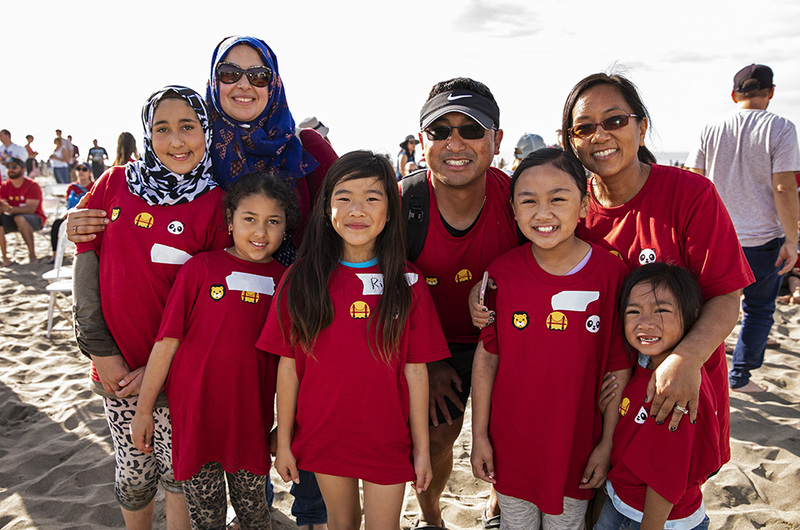 Chinese Immersion School at DeAvila's Team Nibbi/EHDD/Sherwood pose for a team photo. 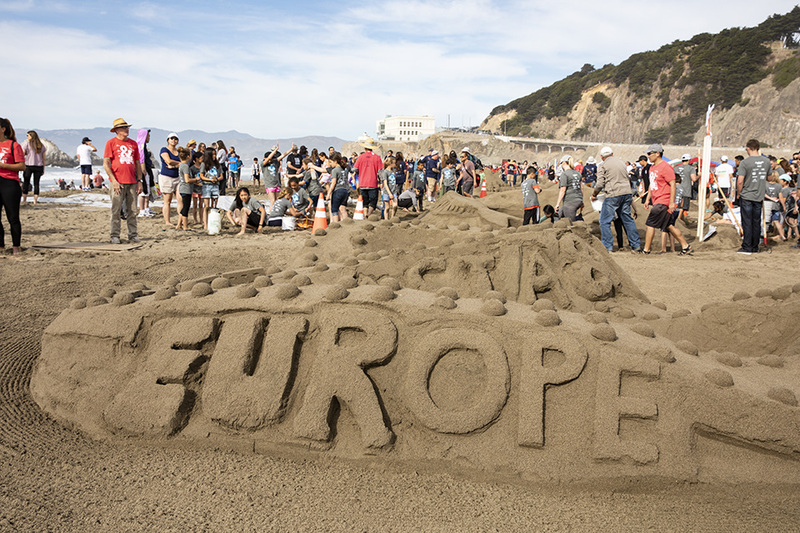 This year's theme was "Building Bridges," with sandcastles that reflected the ways in which we connect and come together. 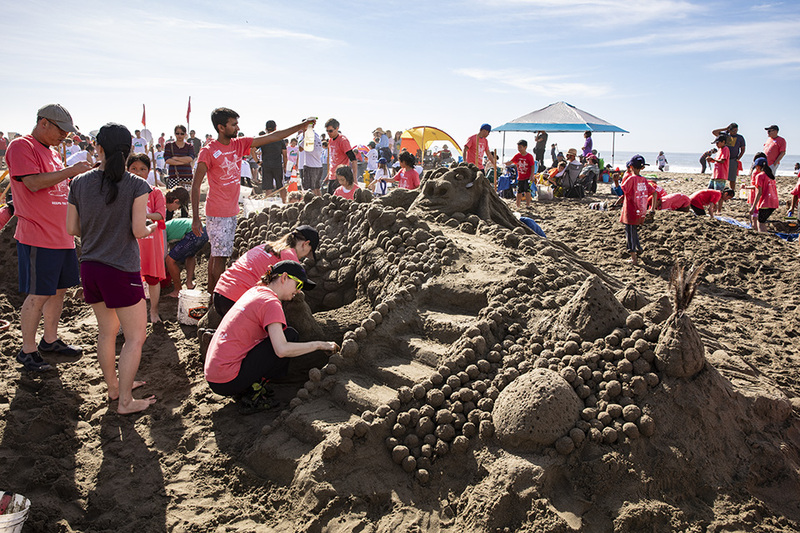 Interpretations from this year's 25 teams ranged from structural connections, like bridges, to community and cultural connections. 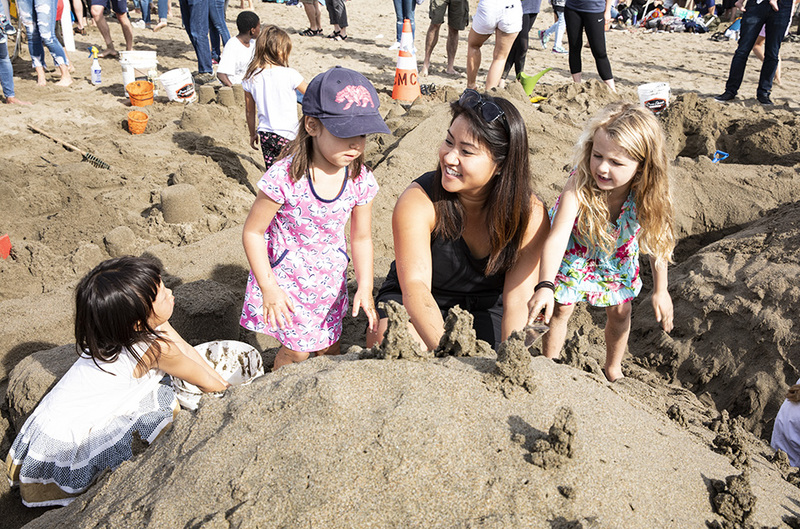 Francesca Oliveira of architectural and engineering firm Skidmore, Owings & Merrill, was part of the team that worked with Clarendon Alternative Elementary School on their sculpture. 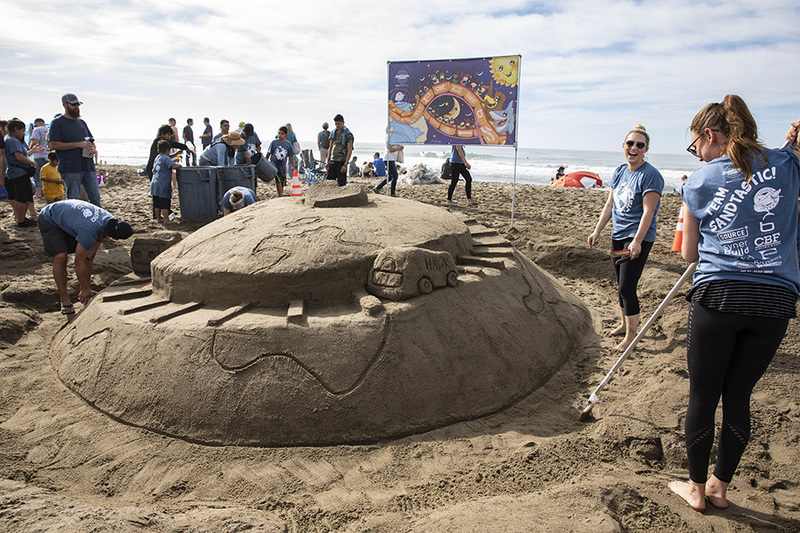 "It's been a fun process," she said. 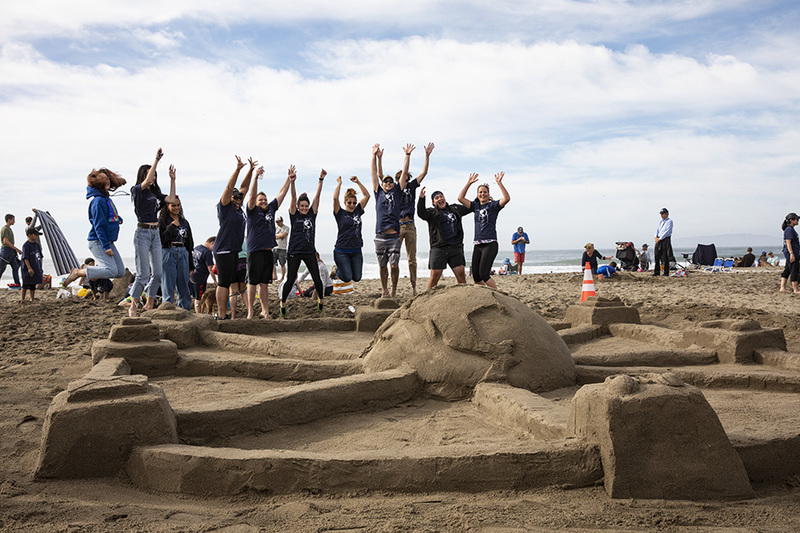 Over a two-month period, students were taught about scale, how to model and the roles of architect, engineer and contractor. 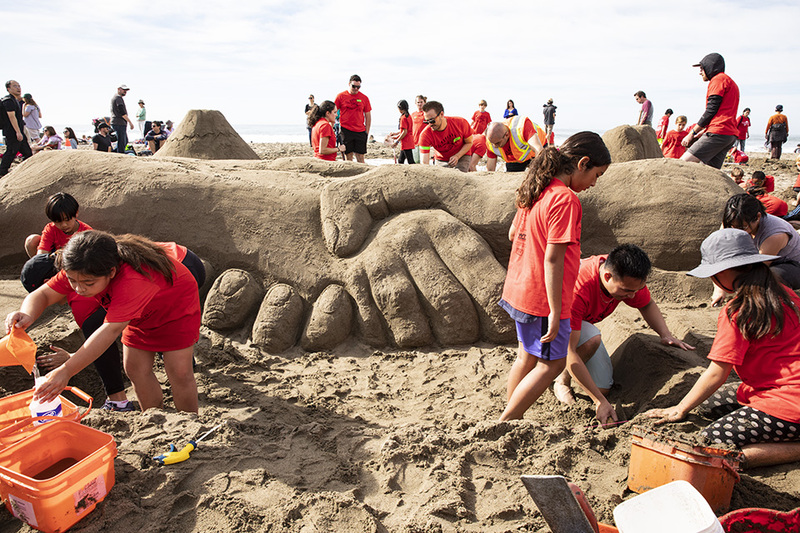 Their final design -- two hands clasping, with Mt. 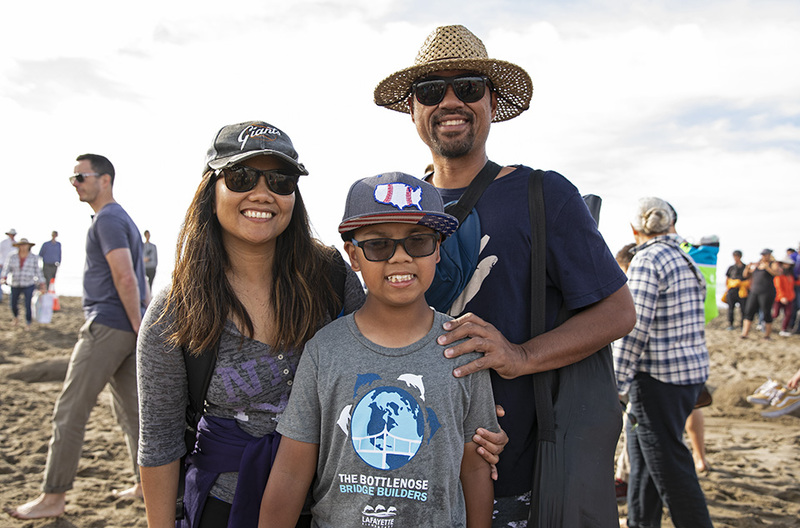 Fuji and Yosemite's Half Dome in the background -- was entirely student-driven. 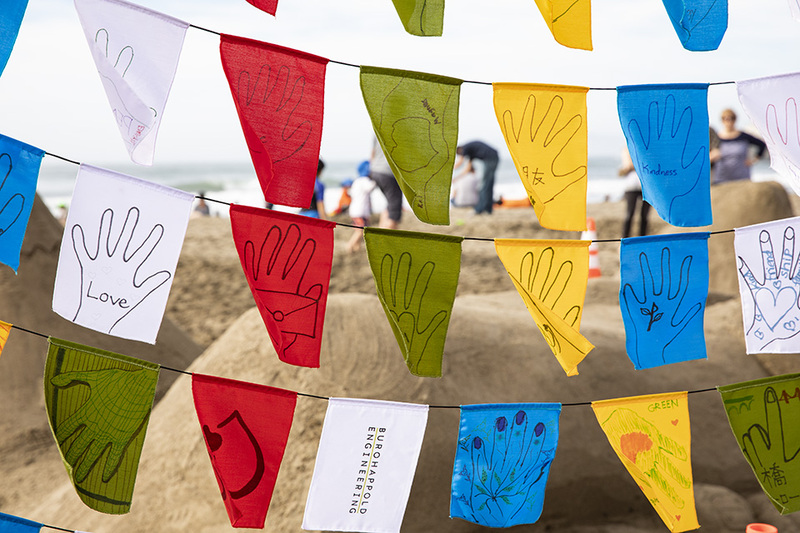 The design was intended to reflect their bilingual school, where students are taught in both English and Japanese. 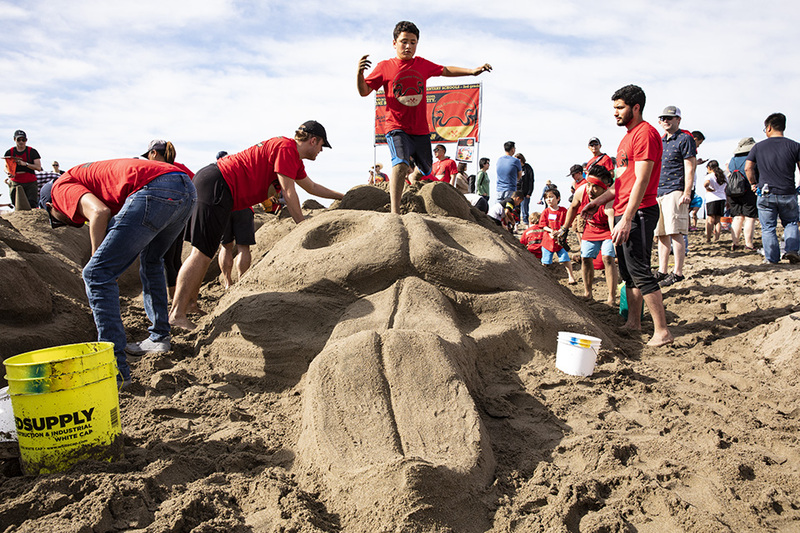 "They wanted to talk about the hands of friendship," Oliveira said, "and sharing ideas across cultures." 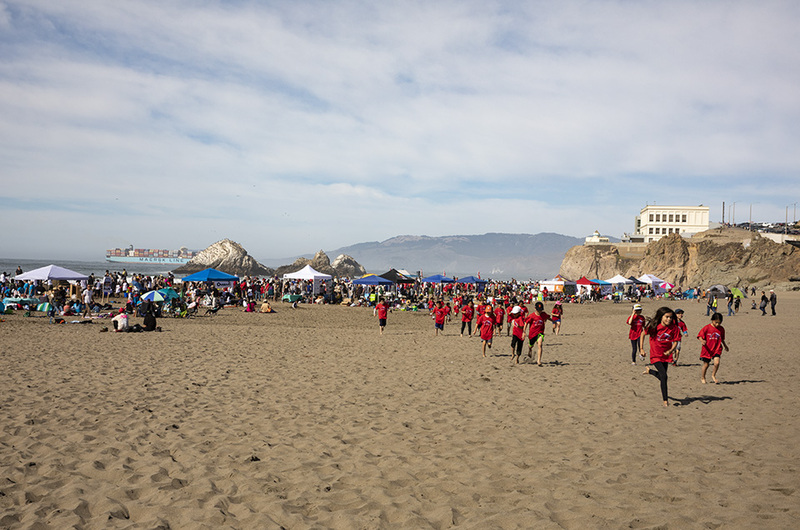 Teams are judged on their designs, craft, theme and teamwork, which includes student participation and collaboration. 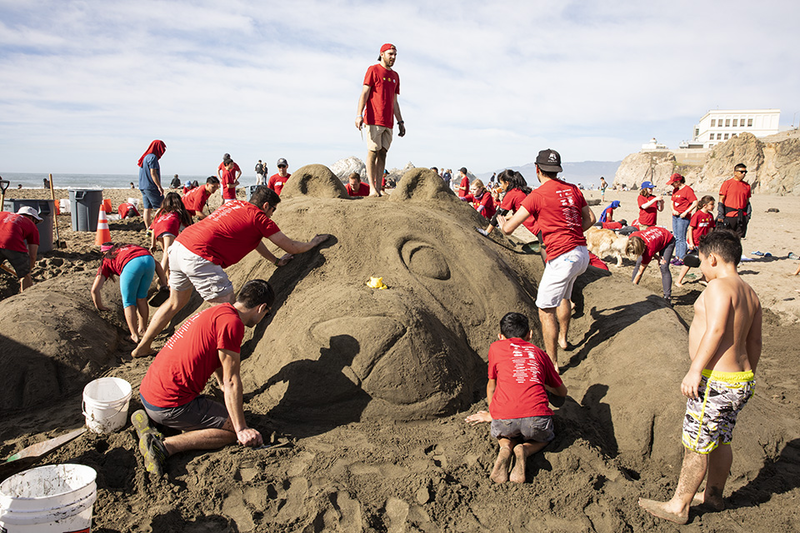 A Best in Show award is presented at the end of the day, along with Silver and Bronze runner-ups. 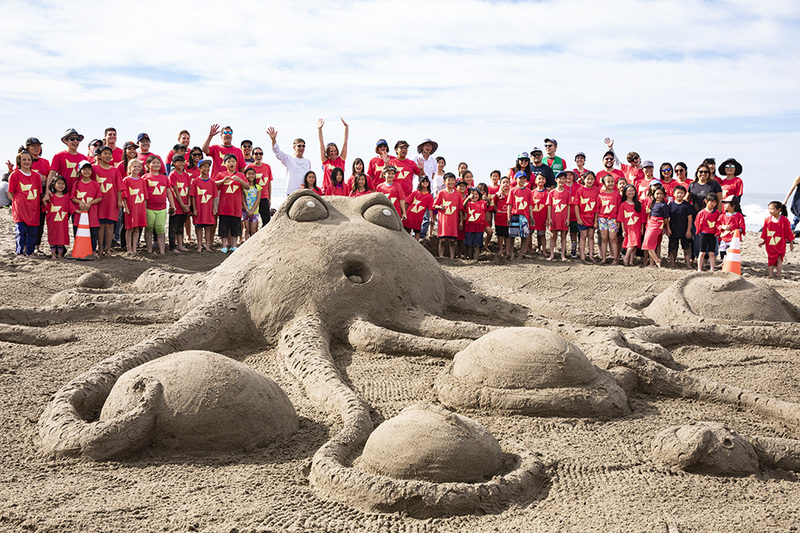 This year's Best in Show went to Team Sand Blasters from Commodore Sloat Elementary, and their sunglass-wearing octopus sculpture. 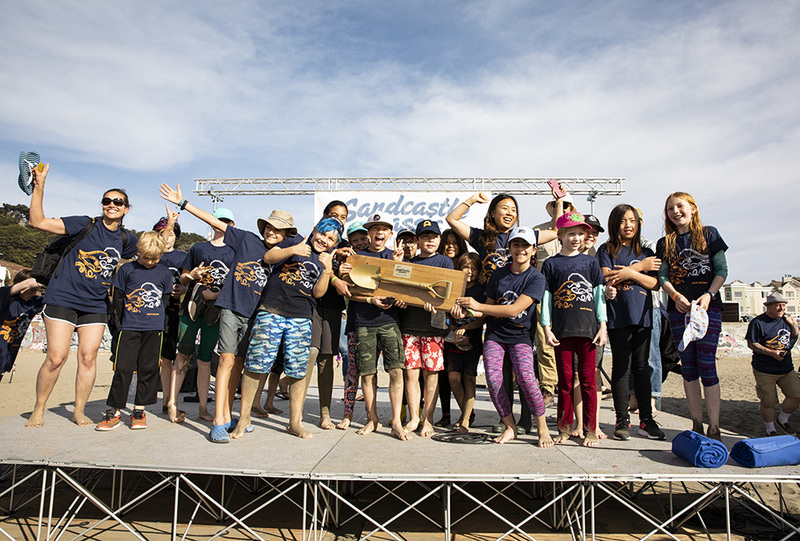 The Sand Blasters Team celebrates their Best in Show Award. 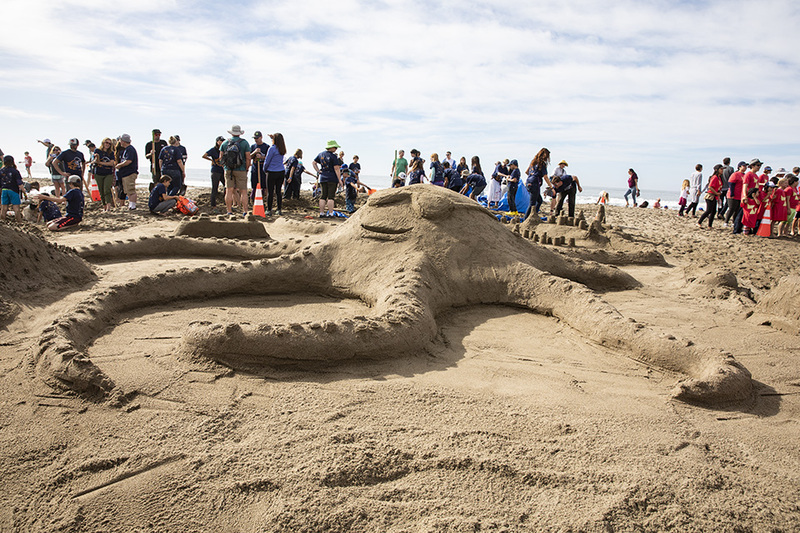 The Best in Show award went to Team Sand Blaster's sunglass-wearing octopus creation. 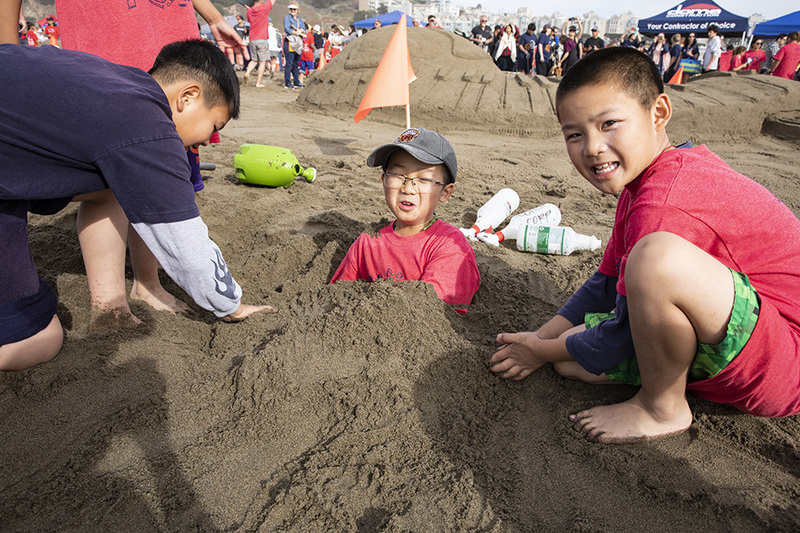 The Bay Area Bridge Trolls Team from John Yehall Chin Elementary and their Bronze Award-winning sandcastle. 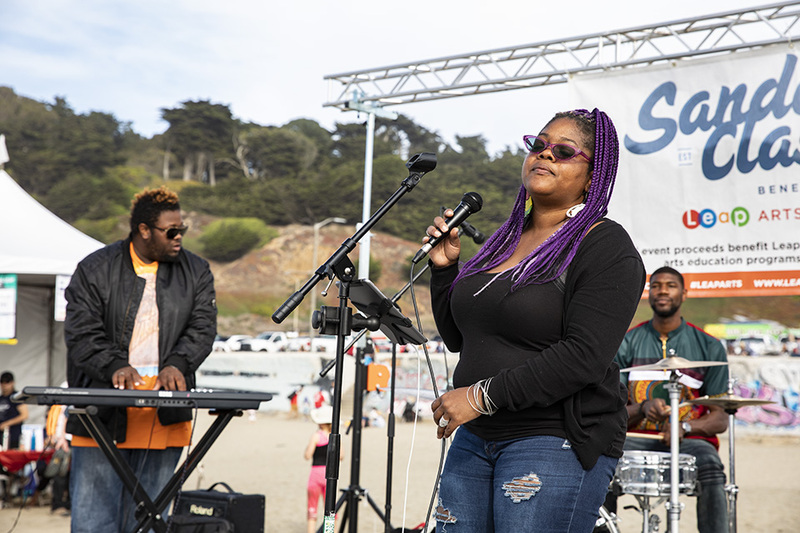 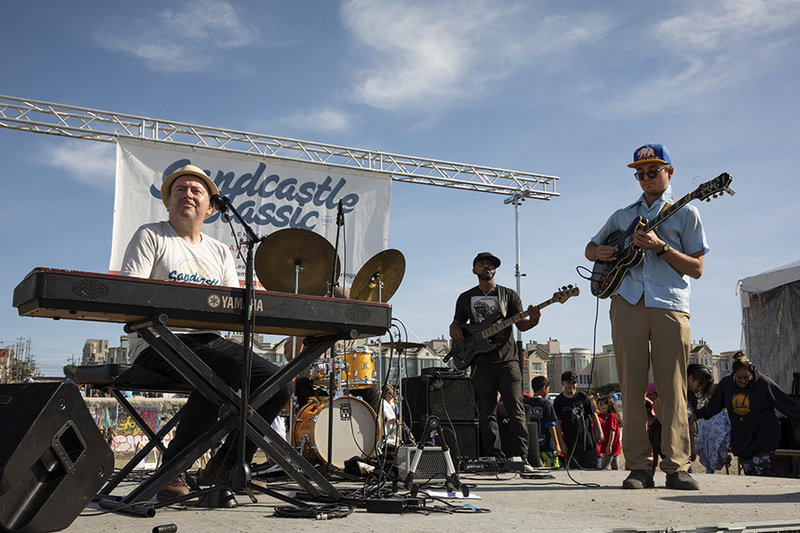 Hip-hop, funk and soul cover band The Pocket performs during the event. 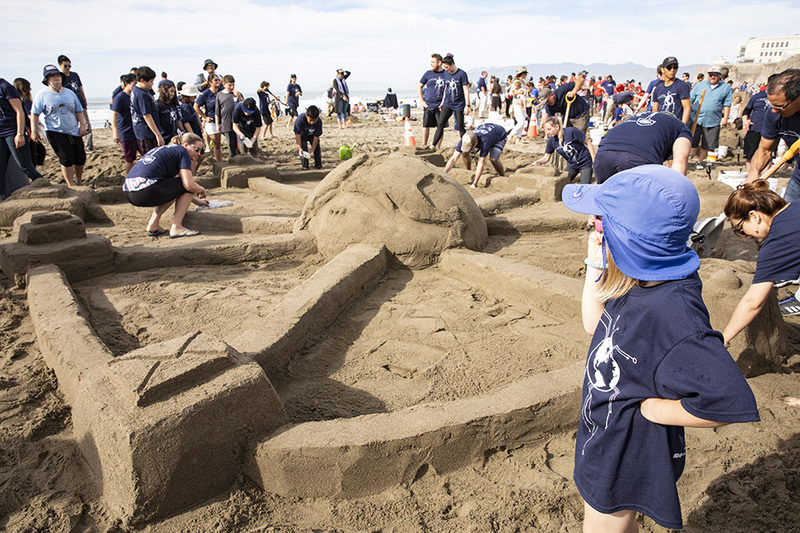 Team members from the Sand Blasters. 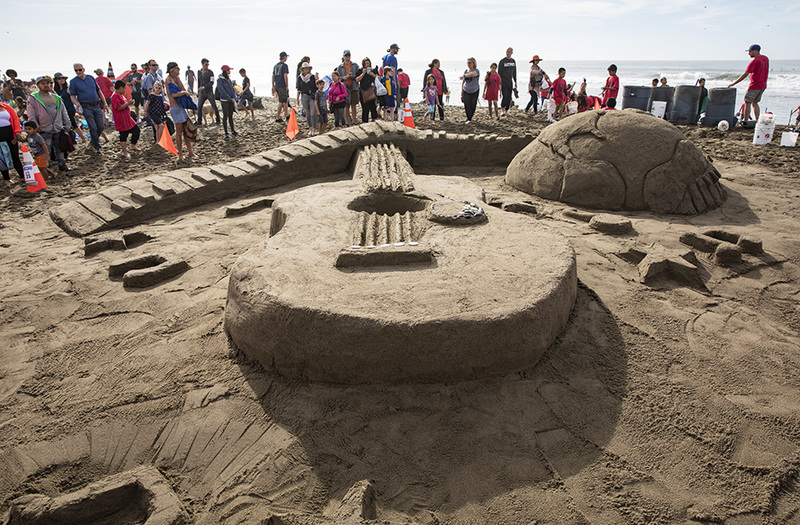 A musical sculpture from George R. Moscone Elementary School's Sandy Eagles.